Why do I have it? Honestly? I like knowing what all the buzz is about, and there’s been a lot of buzz about this book. Summary: Mikael Blomkvist, a business journalist, has just been convicted of libel for a piece that he published regarding the industrialist Hans Erik Wennerström. He is expecting to be in disgrace, so he is somewhat surprised when he is contacted by Henrik Vanger, the elderly head of the multinational Vanger Corporation, and offered a job. Nominally, he will be writing the family history of the multitudinous Vanger family, but his real job will be to research the case of Harriet Vanger, Henrik’s favorite niece who disappeared under suspicious circumstances almost 40 years before. 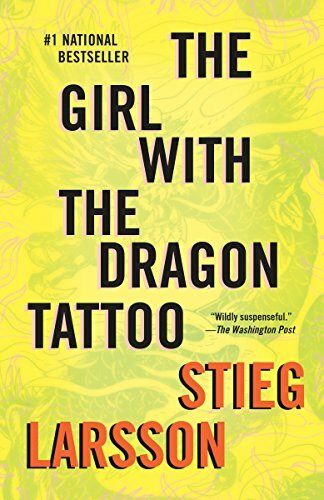 Thrown into the mix is Lisbeth Salander, an asocial young woman whose refusal to cooperate with authorities has led to her being classified as a ward of the state, despite the fact that she’s now in her 20s. Lisbeth is a talented hacker, and works at a security company as a freelance investigator. When her and Mikael’s paths cross, they become uneasy allies, because Harriet’s case is no simple Missing Persons, and they find themselves uncovering secrets they’d never dreamed of. Review: There is absolutely no reason that I should have liked this book. I read straight-up mystery-thrillers very rarely, and it’s never been my genre of choice. I don’t have any vested interest in Sweden, or in journalism, economics, or business politics. I’d heard that this book was really good, but didn’t know much more about it… which in this case probably worked to my advantage. If I’d heard that it was a modern mystery up-front, I probably would have passed it by, and I would have missed out on one of the more engrossing books I’ve listened to all summer. A large part of what made this book so good was the fact that Larsson has created two exceptional characters in his two leads. The characterization on both Mikael and Lisbeth is complex and believable, and both of them are so real and so sympathetic that when they do something stupid, you want to reach in and smack them, not because they’re being annoying, but because you like them so much that you want them to do better. Secondary characters are equally well-done, and Mikael and Lisbeth are so interesting, and such a unique team, that I’m glad there are more books tracking their adventures. The mystery was also intricately built, and well put together. Clues are doled out at a good pace, and it’s rare that we have any information either significantly before or significantly after our protagonists. I particularly liked the linkage between the main mystery of what happened to Harriet and the extensive Vanger family tree: it turned the story into a compelling hybrid of mystery and family saga. While it’s true that I figured out both of the main “reveals” a fair bit before Mikael and Lisbeth, that didn’t make the story any less absorbing; I still enjoyed watching them put together the actual evidence needed to substantiate my hunches. My only real problem with this book was its length. Bits of the book got a little bit draggy, but unlike normal over-long books, the draggy parts weren’t in the middle. Rather, the beginning and the end both needed a little trimming. The prologue, with Henrik getting his annual yearly taunt from Harriet’s killer, was an excellent start, but from there, the entire first disk revolved around Swedish economics and business journalism. And while I’m sure that those subjects are interesting for some people (Swedish economists, business people, and journalists, I suppose), they struck me as intensely boring, and it was an effort of will to push past them. Once the actual mystery is picked up, things get really absorbing really quickly… but then again, about a disc from the end, the mystery has been resolved, and we’re back to business politics and magazine publishing. Ah well. One minor quibble: I listened to the audiobook (which was excellently narrated), so I don’t know if this is different in the print version or not, but I really, really would have benefitted from a) a family tree of the Vangers, and b) a map of Hedestad and Hedeby Island, their home. 4.5 out of 5 stars. Recommendation: Really, really good, and I don’t normally read mystery-thrillers… but it’s definitely recommended, particularly for those who enjoy the genre, and even for those who don’t. Mystery fans who’ve read it: Was this a stand-out, or are they all like this, and am I just missing out? Cover Thoughts: It’s visually very striking and extremely memorable (and easy to spot from a distance). It certainly goes well with the title, although how well either of them convey what the book’s actually about is up for debate. The Swedish title translates to “Men who Hate Women”, which is certainly a lot more apt, although I feel like it’s almost too prosaic. I don’t normally read mystery/thrillers but there is so much buzz about this series that I’ve planned to pick it up within the next few months, after the third is released. So I’m glad you had the same impulse and then really liked it! I’ll remember to persevere beyond the tough beginning. Mysteries and crime thrillers are not normally my sorts of books, either, but I’ve heard this transcends its genre. It’s definitely on my radar. Amanda – It does seem like it transcends its genre, although apart from the elements of family saga, I can’t put my finger on anything that’s different from a normal mystery/thriller. I haven’t read this because I feel like I read somewhere that it was full of graphic violence. Is that right? Or am I thinking of something else? Jenny – I wouldn’t say it’s *full* of graphic violence. I can only think of two or three scenes where the violence is “on screen” — but at the same time, the prevalence of violence against women is a major theme of the book, so it’s certainly discussed a lot. The fact that this is not your type of book and you gave it a 4.5 says a lot. I do love a good mystery and great characters, so I’m sure I’ll enjoy this when I get to it. I am so glad that you listened to this on audio, too. I am in love with Simon Vance. He is such a wonderful narrator. I’m loving his narration of The Girl Who Played with Fire just as well. You make an excellent point about maps and family trees. That would have been really nelpful. As far as draggy parts are concerned, the book was just okay for me until Lisbeth entered. I didn’t find finance journalism all that interesting. After she arrived on scene, I was hooked. The ending is important to put things in place for the second novel, but I understand what you mean. It must be hard to find the right breaking point in a series like that. Great review, Fyrefly! I’m so glad that you took a chance on this novel and enjoyed it. I’m on the holds list for the audiobook of The Girl Who Played with Fire at the library… but I’m all the way down at #8. I’ll get it eventually! The only other thing I’ve listened to of Simon Vance’s was A Spot of Bother by Mark Haddon, which he also did an excellent job with. I won a copy of this so I’m finally going to read it lol. Sounds even better than I remember though! Ladytink – I hope you enjoy it as much as I did! I plan to read this very soon! It’s not my normal type of read, but it looks good! It’s not my normal type of read, either… now I’m wondering what else I’m missing! I hate it when books drag at the beginning, but even more so when they do it at the end. Still, I’ve heard a lot of good things about this one, so I’d be willing to give it a shot. Great review! Anna – The dragginess was much more pronounced at the beginning, when I didn’t know where it was all going. The end took longer to wrap things up than I thought it really needed to, but at least by that point I knew and cared about the characters, so it didn’t bother me so much. rhapsody – Even if you’d had a good atlas of Sweden, I think you still would have been out of luck, since I’m pretty sure Hedeby Island is fictional. :) Thanks for letting me know that I wasn’t missing out. Still, I’m clearly a habitual fantasy reader… every book should have a map! You know I read it (my post is linked) so I’ll just answer your question: it’s a good mystery. I’m really looking forward to reading the next two in the series, and sadly there won’t be any more in the series as the author is now dead. It’s been over a month since I read it, and Lisbeth and Mikael are still very fresh in my mind, which for me means they are very well drawn, very clear characters. Oh yes, book two, coming up soon!! Excellent review and I really enjoyed your perspective as a non-mystery reader too. Susan – That was the sense I’d gotten from reading other reviews, that even for regular mystery readers, this book was top of the pack. Still, it’s inspired me to try to branch out of my comfort zone a little more often. Thank goodness I found these maps…please include them in your reprints….readers shouldn’t have to try so hard to figure out the configuration of the islands…and the first 50 pages could be edited to about 10 pages….otherwise, GREAT READ! A friend highly recommended these to me and neither she nor I are usual thriler readers so, as I was going on a long train journey, I bought all three. Fyrefly your review is spot on but as the financial and journalist stuff interests me I wasn’t bored at the beginning but neither was I obsessed – which I certainly was at the end. NB the UK paperback does have a Vanger family chart in it but not a map. Now I am in the middle of No 2 but sadly back at work so have to keep on putting it down or get a sleepless night. I was trying to work out why this author is so good and I think it is just that he writes particularly well. So many “genre” novels rely on plot and one reads on because one wants to know what happens despite cliche and clunky sentences but Larssen creates situations with such skill and his light touch with description of both place and character mean we enter his created world. His translator is also immensely skillful. What a joy to find this treat! I read this book too and we both picked up the same things on the parts that needed trimming (Swedish economics, business deals, etc). Those plot points were important to the characters but I didn’t find myself as invested as the mystery itself. But I disagree with you on Lisbeth Salander. She is a well-drawn character, but a lot of times it was difficult for me to root for her. I know that she is the title character and most likely her past has a lot to do with why Larsson titled the book “Men who Hate Women,” but I reacted to her as her character would have wanted me to react: I disliked her. She is very capable and I would trust her in her work but can I see things from her perspective? It wasn’t very easy.